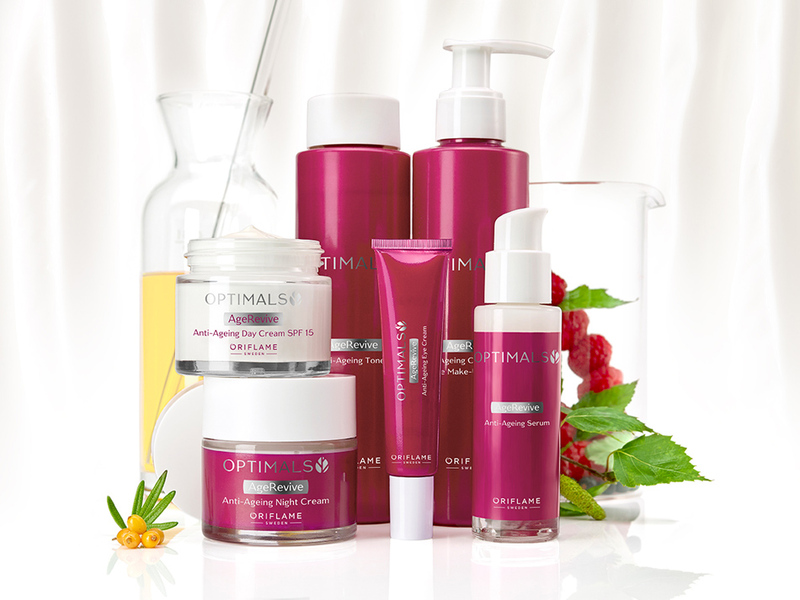 Oriflame’s Optimals Age Revive acts on multiple signs of aging, for younger and radiant skin. An anti-aging line of care based on unique combinations of Swedish natural ingredients. 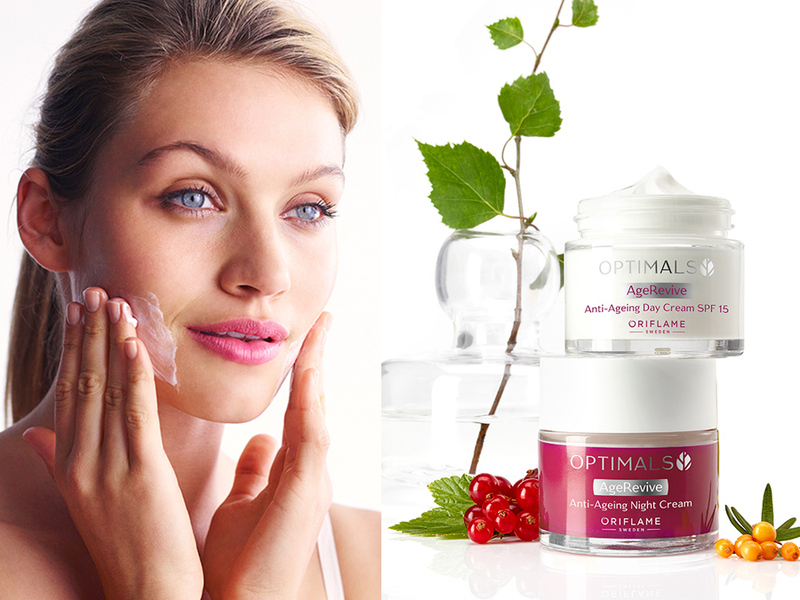 The original Optimals range consisted of three anti-aging lines: Skin Youth, Smooth Out and Vital Definition. All of them will now be replaced by the new anti-aging line with improved formulas, which acts on multiple signs of aging: Age Revive. Their formulas, combined with natural Swedish ingredients, have been perfected by nature and combined with precision by Oriflame scientists. This line minimizes wrinkles and fine lines and promotes smoothness, lightness, firmness, elasticity, hydration and even skin tone *, so it’s the only anti-aging line you need! What sets the Age Revive line apart? All Age Revive products contain a unique blend of Swedish natural ingredients. Each formula helps you achieve beautiful, youthful skin by acting on the main signs of aging. Over time, collagen and elastin levels decrease, which leads to wrinkles and leaves the skin with less elasticity. The new Age Revive line helps to minimize this decrease and repair the firmness and elasticity of the skin. has a great impact on the skin, and can even strengthen the signs of premature aging, decrease the luminosity of the skin and dehydrate the skin. Optimals Antioxidants active as a protective barrier on the skin to combat external aggressions, such as pollution, for a hydrated, beautiful and radiant skin. Gently removes impurities and make-up. Helps reduce fine lines and wrinkles while nourishing and moisturizing. Formulated to leave skin soft and comfortable. An antiaging cleanser that helps to act on multiple signs of aging. Helps reduce fine lines and wrinkles, nourishes and moisturizes the skin and removes impurities. Formulated to leave skin soft and comfortable. With a combination of Swedish natural ingredients and Vitamin E. All skin types. 200 ml. Oats – Vitamins B3 and B5 help to moisturize and soften. Red clover – rich in antioxidants that help protect the skin. Helps reduce fine lines and wrinkles, while removing dead skin cells, toning pores and purifying skin. Leaves skin toned, deeply cleansed and refreshed. An anti-aging tonic that acts on multiple signs of aging. Helps minimize fine lines and wrinkles while removing dead skin cells, toning the pores and purifying the skin. Leaves skin toned, deeply cleansed and refreshed. Formulated with a combination of Swedish natural ingredients and Panthenol. All skin types. 200 ml. Raspberry – Vitamins B and C and fruit acids help to revitalize, refresh and confer light. Juniper – with active anti-oxidants and antimicrobial properties that help clean, balance and purify. Helps reduce fine lines and wrinkles and reduces dark circles and eye circles. Refreshes skin and helps stimulate microcirculation to reduce signs of fatigue. Eye cream that acts on multiple signs of aging. Helps minimize fine lines and wrinkles, lightens and reduces dark circles and dark circles, and helps stimulate microcirculation to reduce fatigue. With a combination of Swedish natural ingredients and Caffeine. Suitable for all skin types. 15 ml. Indian Chestnut – helps improve microcirculation to help reduce dark spots and pockets. Blackcurrant – Vitamin C and sugars that help to give luminosity, moisturize and refresh. White birch – helps prevent the appearance of dark spots. Helps reduce fine lines and wrinkles, moisturize and instantly fill the skin, and helps minimize the appearance of pores, while promoting brightness. An antiaging serum that acts on multiple signs of aging. Helps reduce fine lines and wrinkles, instantly moisturizes and fills the skin, and helps minimize pore appearance while promoting brightness. With a combination of natural Swedish ingredients. Suitable for all skin types. 30 ml. Blackberry – Vitamin C and sugars help to stimulate luminosity and hydration. Blackcurrant – helps fight fine lines and wrinkles. Flaxseed Oil – Omega 3 and Omega 6 fatty acids help nourish and soften. Helps reduce the appearance of fine lines and wrinkles, and moisturizes and lightens the skin. Protects the skin from premature aging and helps to protect it from pollution. Anti-aging day cream that acts on multiple signs of aging. Helps reduce the appearance of fine lines and wrinkles, as well as moisturize and lighten the skin. Protects against premature aging and pollution. Formulated with a combination of Swedish natural ingredients, Active Antioxidant and Active Firming. Suitable for all skin types. 50 ml. Seaweed – Antioxidant action, very rich in vitamin C, helps promote skin brightness. Reduces the appearance of fine lines and wrinkles, moisturizing and nourishing intensely the skin during the rest period. It repairs and reveals radiant, younger skin in the morning. Antiaging cream that acts on the multiple signs of aging. Minimizes the appearance of fine lines and wrinkles, moisturizes and nourishes intensely to restore radiant, younger-looking skin. With a combination of Swedish natural ingredients and Active Firming. Suitable for all skin types. 50 ml. The Age Revive line has been developed with all the products you need for a simple yet effective care routine that will cushion multiple signs of aging. Follow these 4 steps and enjoy the results. Apply the eye cream by gently squeezing the package and passing the applicator in a sphere in the bony area of ​​the eye area, from the inside out, twice a day , Morning and evening on clean skin. Avoid direct contact with eyes. Apply the serum by gently massaging it on the skin. Apply every morning and night on clean skin. Avoid the eye area. Apply Day Cream every morning and Night Cream every night, on clean skin. Avoid the eye area. Age Revive Optimals is recommended for women over 35 who want a naturally beautiful skin and who want a simple but effective routine that acts on the signs of aging, such as fine lines, wrinkles and loss of light. They look for products that combine the best of nature with science.